Minneapolis' Graydon Royce, my former O'Neill "Critics Camp" bunkmate, has all the details in the Star-Tribune. Now, in light of Terry Teachout's compelling plea for more props for the regionals, you may be thinking the Guthrie may not be the best poster child. After all, how many theatres in or outside of NYC can boast: "11 shows on three stages, with an annual budget of more than $20 million." Still--isn't the failure of even the Guthrie, then, to be reviewed regularly in the Times, further proof of Teachout's point? 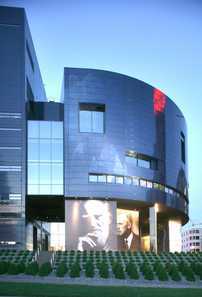 Why is the Guthrie not a name on par with the Art Institute of Chicago as a "must-see" cultural destination? Yeah, yeah, poor Guthrie, I know. But I do wonder that if even the biggies in "The Stix" are ignored, what hope is there for those with the the twenty-thousand dollar budgets? Wait, where can I read more about your days at critics camp? Inquiring minds, etc. Or else, a slow-news blogging day. Seriously, the O'Neill program is great fun and happy to give more info about it if you (or anyone) want to email me. I enjoyed James Lileks's take on the architecture in question. I, too, am a veteran of the O'Neill criticism program. Small world... Another blogger coincidence: George Hunka and I had the same job at different times for Performing Arts Journal/PAJ Publications! Other critical coincidences: my college roommate (we're both from the same town: Racine, WI) was Michael Phillips, film and theatre critic for the Chicago Tribune. Thanks to Kevin for the link to James Lilek's take on the new Guthrie edifice. The biggest complaint he has, and that connects to what I have been writing about theatre in general, is that the new building isn't part of the surrounding community. Will we never learn?